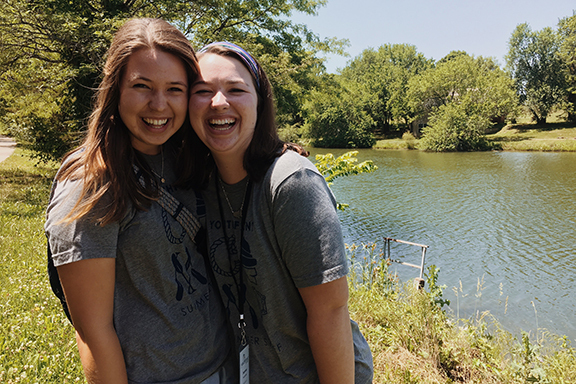 After spending last summer as a cabin leader at Youthfront Camp West, Drury University sophomore Lyndsey Standage decided to change her major to education because of her newfound passion for childhood development. We asked Lyndsey to share some of her story with us, focusing on her faith journey and how Youthfront has impacted her life, even after summer camp was over. I heard about it when staff spoke at a college ministry at my college. What motivates you to keep coming back to Youthfront, even if you’ve participated in Youthfront activities many times before? The friendships I’ve made and the constant push to love Christ. Some of my biggest fears include being alone, comparison to others, and surrounding myself with Christian friends. How does your involvement with Youthfront help you with those fears? Youthfront gave me friends that can encourage me to pursue Christ while helping me learn that I am strong even when I’m alone. Do you think peer pressure is real or not? Absolutely. I think it’s mainly crafted by humans’ innate quality to compete. If someone asked you what Youthfront was, what would you say to explain it? Youthfront is a home for every kid to develop a relationship with Christ. Has Youthfront helped you with any doubts you have about your faith? Yes, completely. The peace that Youthfront gives me transcends all doubts. If you could pick your favorite thing about Youthfront, what would it be? I changed my major to education because I realized working with kids was my passion and the undeniable push I was feeling towards that field of study. It made sense to work with kids, as I had been doing it my whole life from camps to after-school programs. During camp at Youthfront last summer, I had just sat down with my group of middle school girls, probably Week 3 or 4, and that’s when I realized – I am a tool for these young women to learn about Christ, and if I switch to education, my career would be empowering and encouraging growth in students. How is your faith developing even outside of camp? My faith is developing outside camp as I continue to surround myself with friends that have Christ’s joy. Without their encouragement, I would not be anywhere close to where I am now in my faith.